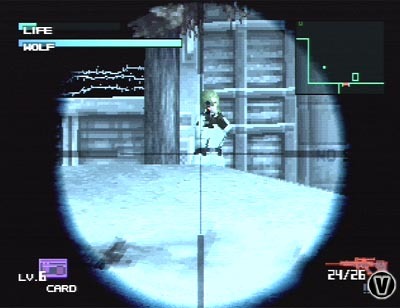 As it has been well documented, Metal Gear Solid is a game that focuses mainly on stealth. 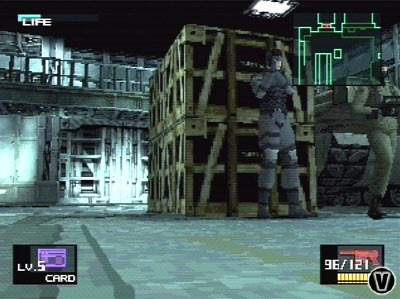 Stealth, as displayed by Solid Snake, is the greatest weapon you will have in the game. Haphazard gunfire and sloppy tactics will get you killed in this game. Period. If you want to make it out of this snowy hellhole in one piece, you'd better learn when to act and when to stay put, and you'd better learn quick. The story, which unfolds in real-time cutscenes using the game's graphics engine, begins with you infiltrating the frozen fortress via an underwater aqueduct. Once you surface, scans weapons, you'll discover your only weapons are a pair of binoculars, a pack of cigarettes, and some rations. From the outset there are things that you'll need to watch out for lest the guards hear your movement and surround you with alarming speed. For example, in the very first screen, there are puddles on the ground. Step in one and a guard will most likely hear it and will stray from his normal route to investigate. If he happens to find you, you can either run, punch him, flip him judo-style, or grab him in a choke-hold and break his neck. Option four is usually the best bet since all the others will usually result in your opponent getting back up. If you successfully get a hold of the guards and break their necks without them alerting others, they won't reappear until you leave the area, allowing you to explore in peace. Each and every part of the game has a number of elements that must be factored into your strategy if you plan on keeping yourself alive. Security cameras, spotlights, infrared beams, automatic guns with radar sights, roaming security patrols, and even wolves make an appearance. Throw in footprints in the snow, breath hanging in cold air, gunshots, explosions, and the sounds of footsteps on metal catwalks, and you have more than enough factors to consider before making careless mistakes. Over the course of numerous levels you will encounter objective after objective, each with varying degrees of difficulty, although none of them is actually very hard to figure out. Also, the game supposedly contains over ten times as much dialogue as the average Hollywood movie, so prepare yourself for a truly cinematic experience. That's not much of a surprise since producer Hideo Kojima (of Snatcher, Metal Gear, and Policenauts fame) originally wanted to be a movie director. 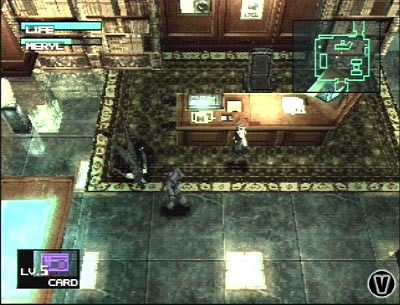 Most of the dialogue takes place on the Codec screen, where Snake can confer with his Fox Hound associates via wireless transmitter. Often, it's one of these informants who will hold the key to completing your next objective. Make sure to check in often, otherwise you might miss something important. 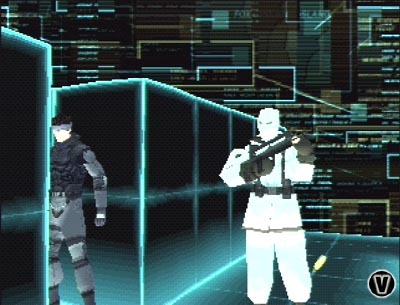 If jumping straight into the game without a forum for practicing all of Snake's techniques sounds too daunting to you, you can always select VR training mode from the start-up screen. This mode will inaugurate you in the ways of Solid Snake. There's a training mode, a time-attack mode, and a gun-shooting mode. A few runs through this, and your skills should be up to par in no time. 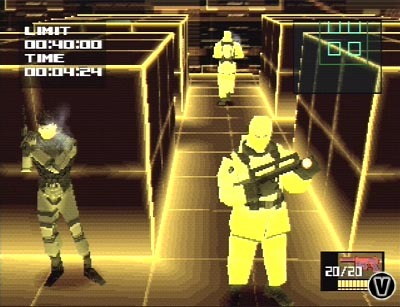 Another option available is a mission log that recaps previous operations executed in the original Metal Gear and Metal Gear 2: Solid Snake. Once you get over the incredible variety of things to do and see, you'll finally notice the intricacies of the graphics. 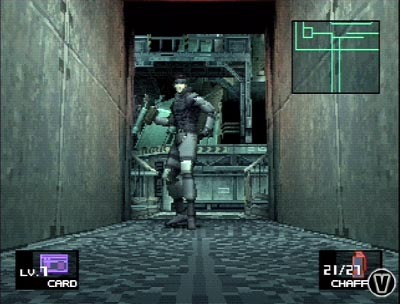 Unlike many other 3D games that take a great many shortcuts to achieve their look, Metal Gear Solid cuts no corners whatsoever in rendering its incredibly realistic environments. Yes, the textures may be a bit grainy, actually, make that a lot grainy, but it doesn't matter when the environments are so convincingly real. Every object is rendered in full polygonal detail. Even a stapler on a desk or a chair near the desk is rendered in full 3D. While it may seem like no big deal in the traditional top-down mode, slip into first-person and closely examine your surroundings. You'll find the complexity and detail of the environment staggering, right down to the maggots in the holding cell. All the characters and vehicles look great as well, with their animations being extremely well done. No motion capture here, everything has been hand-animated, and the results are excellent. The other variables that make Metal Gear Solid one of the most engrossing game experiences ever are things like sound and Dual Shock integration. The sound in MGS is fantastic, with every area having unique sound effects to complement the variety of each section. Areas filled with snowfall sound appropriately muffled and windy, while crawling through an air duct has the claustrophobic ambiance you might expect. Running through water leaves the requisite splashes behind, while submerging under the water sounds exactly as you'd expect. Each weapon, explosion, and electronic device has its own unique sound as well. As far as the Dual Shock is concerned, you'll wonder how you ever got by without it. All games should be so lucky to use the vibration features of the controller to this kind of effect. Every time you're discovered, you'll feel a little shock in the pad that serves to heighten tension. Walk over a trapdoor, and you'll feel a little click that warns you that you've got about half a second to keep moving before you plunge to your death. Break a guard's neck, and you'll feel the snap just as you make the break. Effective in the extreme. Also, Solid Snake moves like a dream when using the analog. Anyone with intentions to get this game should have a Dual Shock to get the most out of it, since the subtleties are too numerous to mention here. On a side note, depending on your course of actions in the game, at least two different endings are possible according to the decisions you make. So choose carefully. So, the gameplay is unique and ingenious in its design, that much we know. The storyline is engrossing and contains ten times as much dialogue as the average Hollywood movie, correct? The graphics, while a bit rough around the textures, are still brilliant when viewed as a whole? Yes. The sound has been lovingly recorded to do justice to the game itself, and Dual Shock support adds that extra something special, n'est pas? Indeed, when you sit back and objectively look at the sheer scope of the game, and take a moment to appreciate its perfection, you'll wonder, is there anything missing here? Well, there are some things that could have been tightened up, and there's a couple glaring factors that pull this game straight out of the stratosphere it was so close to achieving. First, when you flip a guard or knock him down, you'd think in real life, if you wanted to, you could just step on his larynx or pull off some other lethal move. But you can't. If you botch your neck-breaking attempt and merely knocked him down, you'll have to wait for the goon to get back up before you get another crack at him. This seems to be an oversight that, while not enough to be a detriment to the game, remains an annoyance you'd have thought easily remedied. Also, the guards in this game are idiots. If you flip one over, or even shoot him in the back of the head (it takes multiple shots to kill one), he'll get up, dust himself off, look around for a second or two, and go right back to patrolling. If you're spotted by a guard, and manage to stay out of sight, the guards don't remain alerted. They just assume they scared you off and go right back to aimlessly wandering. 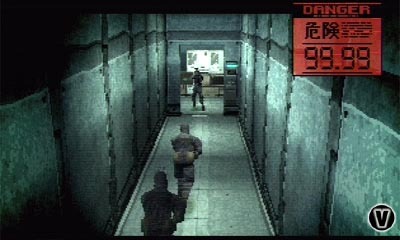 Some might make mention of a touch of slowdown when Solid Snake has to fight more than a couple soldiers, but please, it's hardly noticeable, and besides, this isn't a racing game. The greatest single factor working against the final judgement on Metal Gear Solid is its length. After all the buildup over this game you'd think you were in for an epic of Final Fantasy VII length or something. Heck, some people even scoffed when it was suggested that the new Zelda game would "only" be 40 hours long. That being said, it has to be made known that once you know exactly what you're doing, Metal Gear Solid can be finished in under four hours! A fact that will surely send shock waves through the gaming community - it's practically heartbreaking that the game is over so soon. Granted the first time you play it'll take you longer than that, but under ten is about par for the course. [Editor's note: Videogames.com has learned that the difficulty setting of the Japanese version of MGS will be the easiest of several difficulty settings in the US release.] The next time you play through, however, and there are incentives to bring you back, you will likely finish it in half the time it originally took. When it's over, yes, you will look back and say, "That was the most satisfying game experience I've ever had!" but then the realization will set in that it was actually the length of watching Dances With Wolves. To say that the length is disappointing is generous at best. While the game plan probably looked gargantuan on paper, in actual practice it's criminally short and in the greatest injustice, potentially relegates Metal Gear Solid to being the ultimate rental, although it most definitely warrants a purchase. While people are bound to remember Metal Gear Solid as the game that moved gaming forward in ways nobody had ever really thought of, it will also be remembered for being over so quickly. Heralding a new genre of "avoid 'em ups" (to quote an associate), Metal Gear Solid has set itself a new foundation that, hopefully, Hideo Kojima will be able to weave into a more substantial quest next time around. Even so, Metal Gear Solid is still a must-buy, simply because it is a landmark of a game, more so than Resident Evil ever was, or even Final Fantasy VII, because MGS is more than just another game in fancy trappings. It's groundbreaking. 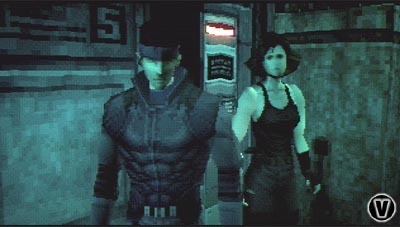 While the current Metal Gear Solid is certainly a work of art in the truest sense, it gives the impression that Kojima really wanted to make a movie-like experience here, and it shows in its length and its incredibly bold cinematic strokes, which is all well and good, except that most people don't want to play a movie. They want to play a game.